A few days ago, I was chatting with Patti Buff and some other SCBWI friends on Twitter about plotting versus pantsing. When I showed Patti my plotting tool, she suggested I share it with all of you. it's kind of a monster. draft exists – to make sure major plot points exist and are approximately where they should be, and to be sure my timeline works, that I haven't forgotten to include setting, etc. Just because I include aspects of these story structures does not mean I believe every element of every story structure is required in a manuscript. But I find it is a nice tool to consider different options, and to consciously decide whether to include elements or not. Second tab: an example. I entered the major plot points for Harry Potter and the Philosopher's Stone and some of the initial minor scenes and basic details (It's been a long time since I read it, so it's possible I got something wrong). Third tab: a comparison of different story structure concepts. 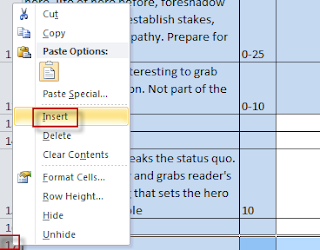 To use the empty beat sheet, enter your target word count in cell I2, and the other values will calculate for you. I start by filling in the major plot points and then add in-between scenes to get from one scene to the next. Insert lines* between major plot points as needed. The "# of pages" and "chapter" columns are there in case you need help figuring out where to put chapter breaks. They must be filled in manually. If you write in multiple POVs, you can add a column* to keep track of which POV each scene is in, and count whether they balance out. Feel free to contact me at laura.rueckert (at) onlinehome(dot)de or on Twitter @LauraRueckert. To add a row, mark the number of the row you want the new line to appear above. Right click and select Insert. In the example, I am adding a row above line 17. To add a column, mark the letter of the column you want the new column to appear to the left of. 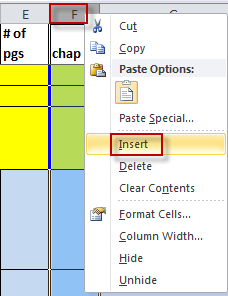 Right click and select Insert. In the example, I am adding a column to the left of column F.